Retailers want to provide a great omni-channel experience. This requires a foundation of precise, real-time inventory visibility all the way from the supplier to the end consumer and everywhere in between. The holy grail in the retail supply chain has been integration across an omni-channel environment, all the way from the supplier to the consumer. The moment of truth happens when the consumer wants an item, whether at the store, on the web, on the phone, or via any channel. Can the end customer be reliably told where that item is, when they can get it, and offered at a price that is profitable to the retailer, yet attractive to the consumer? Unfortunately most retailers still struggle with this. Ironically, even if the item is not available at the point of sale, either the retailer or manufacturer may actually have the product available at another location, but simply lack the visibility to know about it at the point of interaction with the customer. That causes needless lost sales, and sometimes the loss of a lifetime customer, as the consumer goes to another retailer to get what they want. With a decade or more of e-commerce experience under their belt for most companies, why is providing a seamless omni-channel experience still such a challenge? To understand why this is difficult for retailers, it is helpful to look at how we got here. In the late ‘90s and early 2000s, the ecommerce generation took off. Retailers felt immense pressure to build online ecommerce capabilities as quickly as possible. They needed to do this without causing major disruptions to their existing business. They already had Distribution Center (DC) replenishment processes in place with their manufacturers, who are typically driven by seasonal and/or monthly forecasting. At the store level, the retailer monitored shelf inventory and placed regular, bulk restocking orders in a batch mode. Furthermore, most retailers tried to position their DCs in locations that provide the most cost-effective logistics to their stores. In contrast, ecommerce fulfillment happens in ‘eaches’—one-at-a-time customer orders. And the optimum location for that inventory might be near one of the big parcel carrier’s hubs, not necessarily near the stores. As a result, retailers generally put in place separate, parallel inventory locations and processes, and separate fulfillment systems for store vs. ecommerce sales. Furthermore, the ecommerce fulfillment was (and still is) often done by a third party. 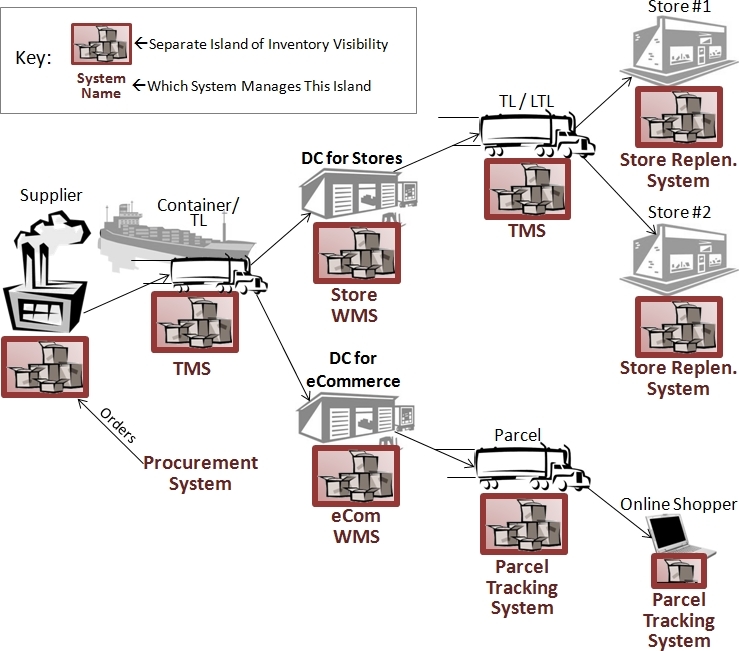 With separate systems and separate inventory stocks in place, stores had no visibility to the inventory in the other channels and vice versa (See Figure 1 - Islands of Visibility). Each store usually had visibility to only the inventory at their own location. 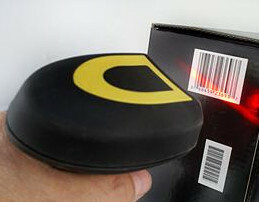 If they were out of stock in the store, the store associate did not have the visibility or tools to check available inventory at the other stores, or across the network of other stocking locations—distribution centers, 3PLs, or inventory at the manufacturer that was available to fulfill an order. Furthermore, they had no visibility into inventory in transit or on order, which were managed by yet other systems. Today, there is a lot of buzz about web and mobile commerce. Each channel provides unique attributes and value to the consumer. But regardless of the channel, one thing is consistent across all of them—the need for fulfillment. 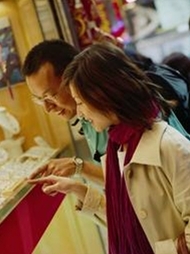 At that desired moment of purchase, the retailer must know what is available and the best way to fulfill the order. A variety of supply chain capabilities have to be in place to make that happen. For example, a lot of focus has been placed over the years on better forecasting, optimization, and allocation systems. Although these are important for omni-channel, even more foundational is the need for a unified view of inventory. This requires a real-time, highly granular view of inventory at each stocking location, knowing exactly what is in each store, the retailer’s DC, the supplier’s finished goods, in-transit, and on-order. That underlying detailed real-time data about inventory location and capability to fulfill is the foundation for cross-channel order promising. Unified end-to-end inventory visibility is central to providing a great omni-channel experience. What is the best way to provide that? It turns out that Warehouse Management Systems can be the key to inventory management and overall visibility. After all, they are great at locating things inside the warehouse. Can these tools be used for finding inventory outside the warehouse? 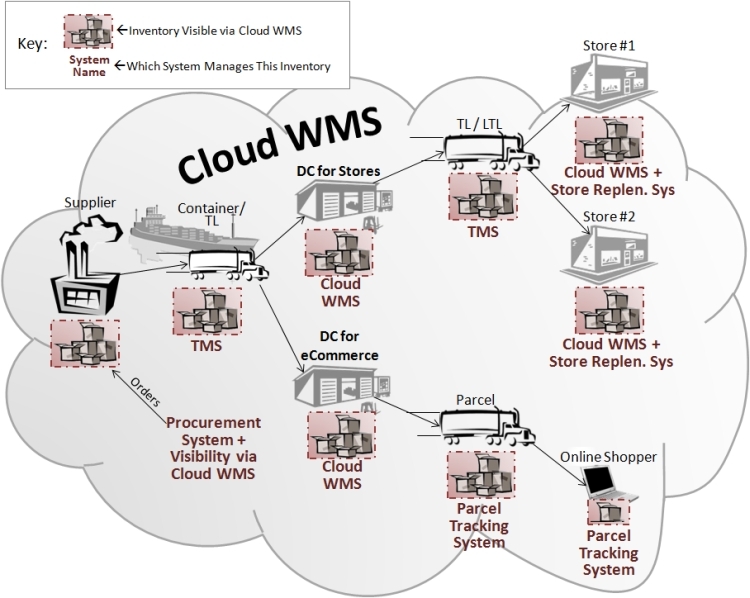 It turns out that some WMS vendors have extended that visibility beyond the four walls.1 To get a true end-to-end picture, from supplier to consumer, we need visibility starting with the order placed with supplier, all the way to the delivery to the consumer, and returns as well (See Figure 2 - Order to Return Visibility). The system should capture the actual P.O.s and DC replenishment orders to get visibility into expected future shipments and dates. It should also track and manage inbound shipments from the supplier, including receiving the ASN and providing visibility to inbound shipment status, such as when there are delays for any reason. On the outbound side of the DC, the system should manage not only the outbound transportation to the store, but also receiving and managing goods in the back of the store, replenishment to the sales floor, and returns and reverse logistics as well, whether those returns are made to a store, a DC, or to the supplier. Locations in the system should be as specific as needed, down to the individual shelf and bin with full visibility into production batches, lots, and serial numbers. The system should allow searches for available inventory across the entire network, all locations, including in transit and on order, if desired. The key is maintaining accurate inventory counts at every stocking location from which fulfillment can occur, as well as understanding what inventory is on its way into those locations and when it will arrive. Armed with that data (and the appropriate allocation and fulfillment policies/rules), the sales associate, call center operator, or ecommerce fulfillment engine can tell the customer exactly what is in stock and when they can expect to receive it. If the item is in the same store as the customer, the system should be able to tell the exact location (down to the fixture and shelf or bin or location in the back of the store) so the store associate can speedily find it and fulfill the request without losing an impatient customer.2 If the desired item is not in the store, but is available elsewhere in the network, the store associate or ecommerce engine can commit to timely delivery because they are confident the exact product desired is in fact available. That level of granularity, unified in one system, all the way from supplier to store shelf—or to delivery at the consumer’s location for ecommerce and direct-to-customer store sales—provides true precision and completeness in knowing where your inventory is, whether it is in motion or at rest or in the hands of the customer. That is the foundation for the unified omni-channel experience that so many have written about and are hoping for. Cloud-based extended warehouse management reaching all the way from the supplier to the consumer is well positioned to be the ultimate master database of all transactions affecting inventory—the hub for improving overall supply chain execution, and providing a great omni-channel experience. Beyond supply chain-wide inventory locating, which is a catalyst for increased sales, cloud-based solutions are especially well suited to solving a number of other supply chain-wide challenges. A cloud-based, pan-supply chain inventory/warehouse and logistics solution can provide end-to-end, real-time, detailed data coming from various sources across the chain via automated data collection such as RFID, barcode scanning, and POS devices. The architecture of the cloud facilitates integration with other systems to collect and centralize inventory-related activities, transactions, and data. The same architecture provides the ability to share relevant information with other systems. In short, a cloud-based WMS can make an excellent supply chain-wide integration hub and repository to manage the overall network with less inventory, higher service levels, and better execution. Warehouse management has always been a key component of effective supply chain management. Now, cloud-based extended warehouse management opens up a whole new level of intra- and inter-enterprise omni-channel integration and performance.